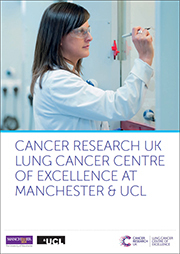 A big thank you to all involved and to all those who contributed to the huge success of the CRUK Lung Cancer Centre of Excellence second Conference at the Midland Hotel in Manchester, 3rd-5th December 2017! The Conference brought together 196 international attendees, including experts from across a wide range of disciplines, to discuss the latest advances in Lung Cancer Research and how we can continue to drive forward progress. Among those in attendance were over 70 PhD students and post-doctoral researchers from a range of institutes across the UK, who had the opportunity to interact with world renowned experts. This year, the Conference programme hosted a number of world-leading Lung Cancer researchers, speaking in sessions which reflected our Centre’s broad research focus, including Discovery Science and Target Identification, Immunology and Tumour Evolution and Heterogeneity. We were privileged to be hosting keynote speakers Professors Mark Krasnow (Stanford University) who spoke about dissecting Lung Stem Cells and Cancer Initiation at single cell resolution, Tyler Jacks (KOCH Institute For Integrative Cancer Research At MIT) who gave a talk on Engineering the Cancer Genome, Harry de Koning (ERASMUS MC) who discussed the Dutch-Belgian Lung Cancer Screening Trail (Nelson) and Julien Sage (Stanford University) who talked about Intra-tumoral and Inter-tumoral heterogeneity in SCLC. In addition to invited speakers, attendees were invited to submit an abstract for short talks and four talks were featured: Professor Bruce Ponder’s (University of Cambridge) talk on Airway Response to Smoke Injury and Lung Cancer Risk featured in our Early Detection & Pre-invasive Disease Session, while Roderick Kortlever’s abstract on how MYC Cooperates with RAS in Lung Tumourigenesis In Vivo By Programming Inflammation And Immune Suppression featured in the Immunology session. The Biomarkers session featured a short talk from Sumitra Mohan (CRUK Manchester Institute) on her work on cfDNA in Small Cell Lung Cancer, and Emilia Lim (University College London) talked about Dynamic Transcriptional landscapes in NSCLC in the Tumour Evaluation and Heterogeneity Session. During the three day event, PhD students and post-docs working in Lung Cancer took part in thought provoking and insightful poster sessions which offered them an opportunity to showcase work and receive feedback from experts and other researchers in the Lung Cancer sphere. The Poster Sessions, and the Conference as a whole, was a great opportunity for interacting and networking; and, like in our previous conference, led to some to discussions about potential joint research collaborations. In addition to this, the event hosted a Careers Workshop for attendees, highlighting some of the funding opportunities available for early career researchers and clinicians with CRUK. The feedback for our second conference has been excellent, and we are very excited to host our Student/Postdoc School this autumn.